I am a big fan of social media. First, it keeps me connected to those I love in times of isolation, and second, it allows me to speak the truth about Mental Health. In 2011 a diagnosis of major depression, panic disorder and Generalized Anxiety, set me up for some major time off work. This is when I became an advocate for myself and a voice for those with mental illnesses who find it difficult to express themselves. Remember, the journey to recovery is a unique spiritual, medical, physical, and/or psychological experience to be taken by the individual affected. In other words, what works for me, may not work for you, so when reading my post, please take that in consideration. Never, over the years, have I declared my way best (a fix all) yet, sharing my journey seems to resonate with some of my readers going through similar experiences. Often we sit… Once my daughter came next to me and started breathing deeply, cuing me in the rhythm of deep breath and eventually I end up following, inhaling and exhaling together as I come down from a shattered morning. Just a few weeks ago, my good friend Diane came to pick me up to go shopping. As I entered the car shaken and immersed in anxiety, she said, in her awesome Dianish way : « Hey Chickie, hows it going? » I just sat there, silent as tears welled up. Then I answered: « Not good, not good at all » . Diane immediately took my hand as I wailed on about this and that and that and this. « Never be sorry for being YOU » she replied. The feeling of knowing she was there next to me, rubbing my back, validating my feelings, and just really looking at me with loving eyes, helped me relax. Comfort was all that I needed. 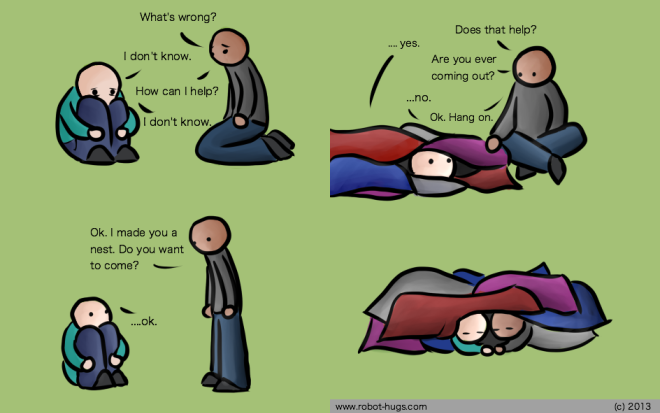 I will tell you one thing about most peeps with mental illness : We often feel like we are a burden to others. Especially when in a seemingly downward spiral that lasts more than a few days. So when in doubt, please just hold space for us, sit and listen. That day, Diane blew me away. I have (and I am telling you the truth) never experienced a friendship so unconditional, so loving which allows me to be who I am and it is OK. In other words, there is nothing to fix about me. I am whole, and loveable just the way I am, even with my panic attacks, quirks, and sillies. The power of a hug. Silence can be golden, physical touch is too. Feeling often alone I often seek hugs, yet, there are times, that is isn’t possible. So when a person comes along and holds us in a big bear hug, this often melts away all tears or even better, allows us to cry in the safety of loving arms. Just this Christmas, my family was visiting (I had not seen my dad in a year) and it was time for them to leave. Since I was the cook and host, I felt like I didn’t have much « quality time » with my dad. Although we speak every single day on chat, having my « daddy » around is always precious. It bring up feelings of comfort and protection. However, when it came time for him to leave, my heart melted into a big pile of mush, and for the first time since I was around 10 years old, I started to cry. The sorrow I felt was deep, and I wanted to run to him and wrap my arms around him and not let go. Then, as fast as my dad turned around and said bye, I felt 2 arms around me, comforting me in silence. It was my brother. The one who always seems to want to say the « smart thing to fix me » but he didn’t. He just hugged me until my dad was down the stairs and out the front door. « I see you, I hear, you and I validate you »… and that can all be said with no words at all. TODAY IS #BellLetsTalk Day. 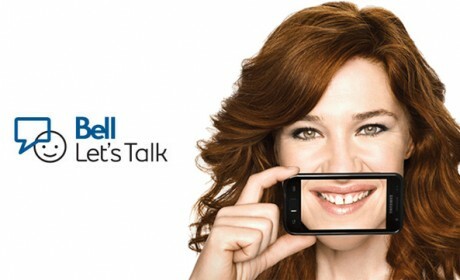 For every tweet, Bell will donate 5 cents towards mental health initiatives. Please tweet this with the hashtag #BellLetsTalk !